Continuing our tour around the boroughs, Mike Paterson - founder and director of London Historians - chooses his personal top ten for Hounslow. Mike founded the lively London Historians association in August 2010 to provide a common point of reference for all those with an interest - at whatever level - in the history of our city. He lives in Brentford and is active in several local history groups in his area. He's a regular on our podcast, an enthusiastic blogger and is on Twitter as @LondonHistorian. Got different ideas about the borough? Let us know your favourite things in Hounslow in the comments. This has to be one of London’s top suburban museums and guardian of our industrial heritage. 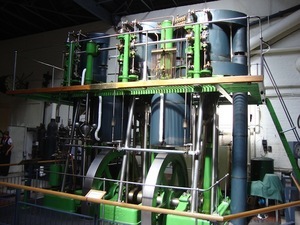 Housed in a former Victorian pumping station, the museum has two main themes: water and steam engines. The Water for Life gallery shows us how Londoners have procured their water for the past two millennia and how it was used. There are plenty of pipes, ducts, taps, washers, valves made of wood, clay, iron and plastic and many historic domestic devices. The story of cholera and John Snow is re-told. Then there are the industrial steam engines, nine of which are in full operational trim: they are all pristine. The museum’s volunteers run at least one of them every Sunday and on the New Year’s holiday fire up all of them. Kew Bridge Steam Museum is one of those enlightened museums whose ticket is annual, not just for the day, so you can return many times for one cost. And I do. 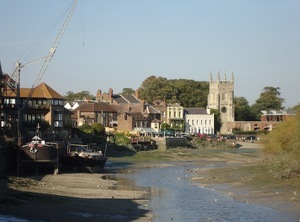 In matters historical, there is friendly rivalry with our neighbours in Kew due south of across the river. They have world famous greenhouses. 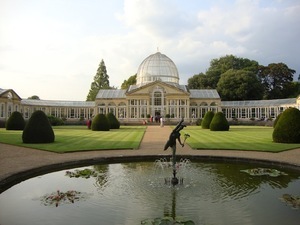 But we have the beautiful Great Conservatory in Syon Park built of glass and metal in 1830 by Charles Fowler, thus pre-dating both Decimus Burton’s Palm House at Kew and Joseph Paxton’s Crystal Palace. Syon Park also boasts, in my opinion, the best garden centre in the Borough. As for Syon House itself, it is the London home of the ancient Percy family, Dukes of Northumberland; they still use it today. It has touched – and been touched by - more history than you can shake a stick at. Unfortunately, the house itself closes during the winter when the Percys are in residence. Honorary mention goes to the Orangery in Gunnersbury Park, former home of the Rothschilds. Although sited in South Ealing, the park is jointly owned by Hounslow and Ealing. Always a tough one, and so subjective. But I’m going to plump for St Michael and All Angels in Bedford Park. This is a relatively modern church, built in the early 1880s and designed by acclaimed architect Richard Norman Shaw (1831– 1912) who also developed much of the surrounding residential housing of Bedford Park - a very pretty area. 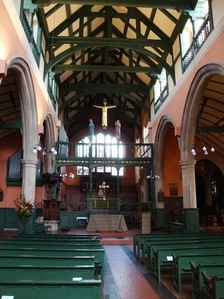 St Michael and All Angels is noteworthy for its beautiful Arts & Crafts interior done in a striking deep green and apricot, an irresistible combination. The church clock is dedicated to Harold Wilson (not the Labour PM), one of three out of five of the incumbent vicar’s sons who died on battlefields in World War I.
Incidentally, there’s a very agreeable pub opposite – the Tabard – home of the Tabard Theatre. We are spoiled. We have Syon House, Osterley Park, Boston Manor, Chiswick House and Hogarth’s House. They are all highly significant, both historically and architecturally. For different reasons, you couldn’t put a fag paper between them, but with my arm twisted hard behind my back, I shall pin the rosette to Hogarth’s House for the simple reason that it is open all year round while the others all close for the winter. The painter, engraver, entrepreneur and philanthropist lived here with his wife Jane from 1749 until his death in 1764. Built in about 1714 it could hardly be any earlier early-Georgian than this. The four storey (including attic) house has been closed for three years for total restoration and re-opens to the public on 8 November (free admission). Perfect timing. Until 1980 the laurel would definitely have gone to the old Firestone Factory, our rival to the Hoover Building on Western Avenue. Unfortunately, in 1980 it was cynically razed by developers over a single weekend within days of being listed. 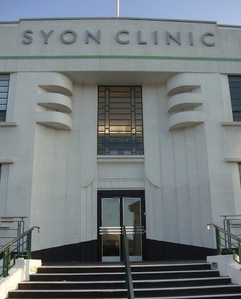 It was one of a plethora of Art Deco industrial buildings along Brentford’s so-called Golden Mile, most of which have fortunately survived and virtually all built in the 1930s when American companies (in particular) were opening UK headquarters. Candidates include the Gillette building with its famous clock tower and the old Beechams building, which has been converted into flats. But to my mind the prettiest, and with the cleanest lines, is the old Coty Cosmetics Factory (1932) designed by ubiquitous Art Deco champions Wallis, Gilbert & Partners. Boils down to four, in my opinion, all good. Three of them are along Strand on the Green, from Kew Bridge in the direction of Hammersmith, perfect for a pleasant pub crawl along the tow path. The Bell & Crown, The City Barge (where you may bump into two diminutive TV Geordies having a pint), and the Bull's Head, which has a strong track record of excellent food. Sit outside the City Barge of an evening for the Planes (Heathrow), Trains (Kew Railway Bridge) and Automobiles (Kew Bridge) experience. But the pub which trumps these on the basis of riverside view, is the historic London Apprentice in Isleworth, a short walk from Syon Park. The pub is so named because apprentice boys from the City used to come upriver on their day off for a lengthy sesh. A rowdy lot. The London Apprentice is much more sedate nowadays. Hell’s bells. The length and breadth of Hounslow is awash with fabulous eateries for every palette and pocket. You can’t have too many Indians and Thais, but there are too many to pick a clear winner from their ranks. Many of our pubs put on a good show, but I think pubs are ineligible for the purpose. However, I will mention the Pilot near Gunnersbury Station, a lively gastro-pub without the prententions. La Trompette in Devonshire Road, Chiswick has an unbroken record of superb food and service, a very swish, excellent wine selection - not inexpensive, however. But whenever I have a visitor from outside of the borough and I wish to give them a guaranteed excellent dining experience at a fair price, I head straight for Carvosso’s at 210 Chiswick High Road. It’s housed in a former police station (you can dine in one of the holding cells if you book well in advance and ask) and stables. Staff are friendly and attentive, atmosphere superb and an uncomplicated menu of exquisite fare. Front of house has a lively wine bar area which doesn’t impinge at all on the restaurant section. We are inordinately proud of our brewery, makers of the wonderful London Pride. Where there once were dozens, there are no significant large brew houses left in London apart from Fuller, Smith & Turner. The company started business in 1845, although beer has been brewed on the Griffin Brewery site for over 350 years. Creeping up the office block is what the company claims is the oldest wisteria in the country, older even than Kew's. 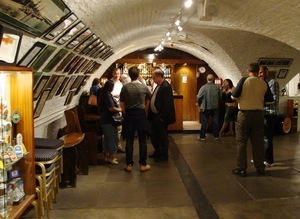 There is an on-site museum which you can visit as part of Fuller’s regular brewery tours, an experience I can heartily recommend. The Powhatan “princess” visited England in 1616-17 with her husband, John Rolfe, a Virginian tobacco grower (not John Smith, as is popularly believed). The Rolfes lived in a house next to the London Road, opposite the north edge of Syon Park. The site is now a Royal Mail sorting office. Pocahontas was presented to James I and was feted by London society, but probably more as a curiosity than as a dignitary. Unfortunately, she fell gravely ill on board a ship in the Thames estuary on her return journey to America. She was taken ashore, but died in Gravesend. The site of her grave remains unknown. Two centuries later, another notable American in the borough was John Quincy Adams, who, as US ambassador to the Court of King James, called Brentford home between 1815 – 1817. We have already mentioned Kew Bridge Steam Museum. One would be inclined to nominate the wonderful Tropical Zoo in Syon Park but its future is a little uncertain with plans in train to move it to Hounslow Urban Farm in Feltham in the New Year. The Farm is a fabulous family attraction in its own right, so that’s our best day out with the kids. It’s on 29 acres and visitors can enjoy a variety of colourful and unusual farm animals, including five types of pigs, goats, cows, rabbits, ducks, geese, alpacas, rheas and chipmunks. Hounslow Urban Farm also participates in rare-breeds programmes to preserve farm animals in danger of disappearing in our age of intensive farming. Other posts in this series: Barnet, Brent, Bromley, Hammersmith & Fulham, Haringey, Lambeth, Lewisham, Redbridge, Southwark.